The question of what a person wants for his or her birthday is always a tricky one. So when the boy asked me what might hit the mark, I threw it back to his court, not wanting to be put in the driver’s seat. My only suggestion: something different that we can both learn from. And on my birthday day, that’s exactly what I found wrapped up for me. A class for two to learn to make dim sum at the aptly named, School of Wok in Covent Garden – the boy done good! The school is a new addition to Chandos Place, having been set up in late June by Jeremy Pang. He began cooking after deciding to change his career path in 2009 and retrain as a chef. 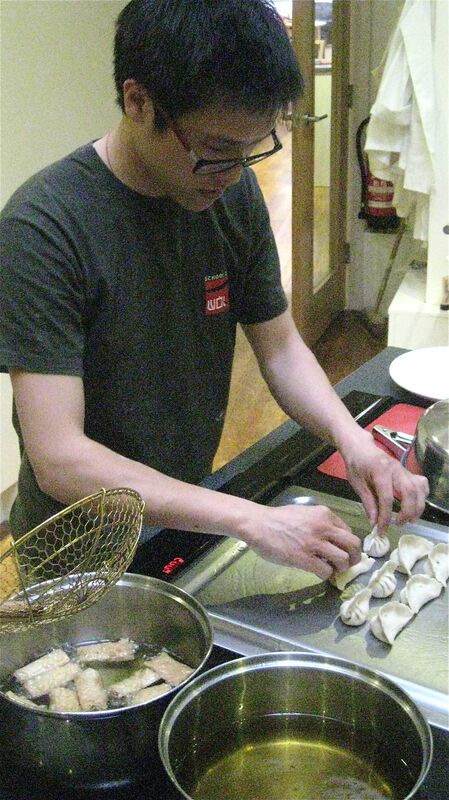 After studying at Le Cordon Bleu and doing extended visits to Hong Kong (where his family originates), Jeremy set up a mobile cooking school which rented space from places like Ping Pong to teach corporate guests to make dim sum and stir fry. It’s not necessarily surprising that Jeremy would be drawn to this arena – his father’s family immigrated to England in the ’60s and started up some of the first restaurants in London’s Chinatown, while his mother’s family started up the well known Ho’s bakery in Manchester. Cooking – it seems – is definitely in his blood. Much of his inspiration comes from what he learned growing up around restaurants and in the kitchen with his family and he has an exuberance that’s hard to miss. He’s also very informal and welcoming, which made us feel relaxed as soon as we entered the school on a hot summer evening. The cooking menu for the night included glutinous rice in lotus leaves, crisp prawn and tofu rolls, Jiaozi and BBQ spare ribs. I’d barely eaten anything all day in preparation, a fact I was very glad of later. We were joined by two other couples – a perfect class size really – and Jeremy began by taking us through the staple ingredients that are present in flavouring much Cantonese cuisine: soy sauce, rice wine, sugar, sesame oil and ketchup. “The British left two things behind in Hong Kong and one of these was ketchup,” he clarified. The boy works up the courage to woll some dumplings! delicious things like garlic, ginger and hoi sin sauce before moving quickly onto learning about lotus leaves. Standing around the chunky wooden chopping station, dressed in our very cool School of Wok aprons, we learned to separate and work with this delicate, pungent leaf. Glutinous rice had already been soaking for two hours in cold water, and was then mixed with salt, pepper and garlic oil to be steamed for 20 minutes. We then mixed our meats (chicken thighs and chinese sausage) with rehydrated black mushrooms and a rich marinade before it was whisked away to be cooked on the grill. When both the rice and meat were done, it was laid out on small squares of the lotus leaf and wrapped to be steamed for another 20 minutes. 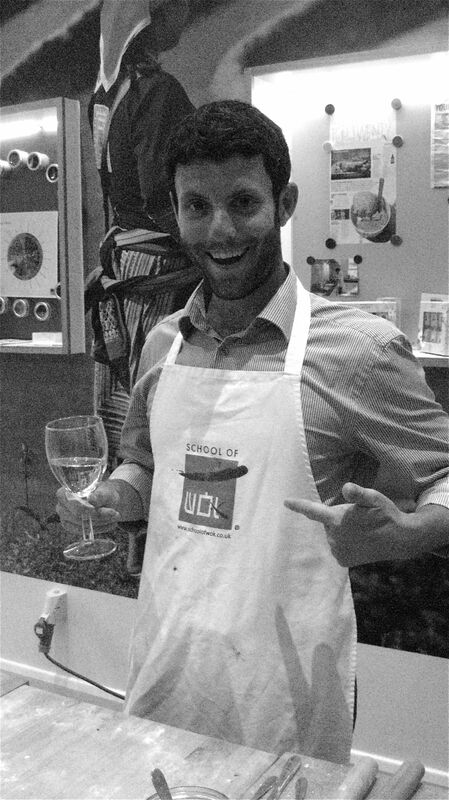 As a reward for completing our first two dishes, Jeremy dished out the wine – as we learned, to up our courage to make homemade jiazi (or as the Japanese term them, gyoza). These dumplings are easy to devour down but don’t be fooled into thinking they’re easy to construct. Filled with pork, prawns, coriander, garlic and ginger (among other aromatic ingredients) these are some of my favourite dumplings. I soon learned, they do not love me. The dough is made from two simple ingredients: flour and water. After mixing and folding, it’s kneaded for five minutes until elastic. We learned to do them fully from scratch, which included taking small balls, squashing them into a circular fashion, and using a two-hand technique whereby you turn the circle with your left hand while using a small amount of pressure on a little rolling pin to roll the edges with your right hand. It is mystifyingly difficult – or, at least for me it was. The boy won praises from Jeremy for his perfect-edged dough circles, while I just puzzled him. I think I made one that looked right out of the 30 I tried over an hour long period. These small circles of dough are then filled with the meat, before being folded over and pinched together into a half-moon shape, fried and steamed. They were delicious, but all the wine in the world couldn’t have made me confident enough to get them right! Just some of our delicious creations. 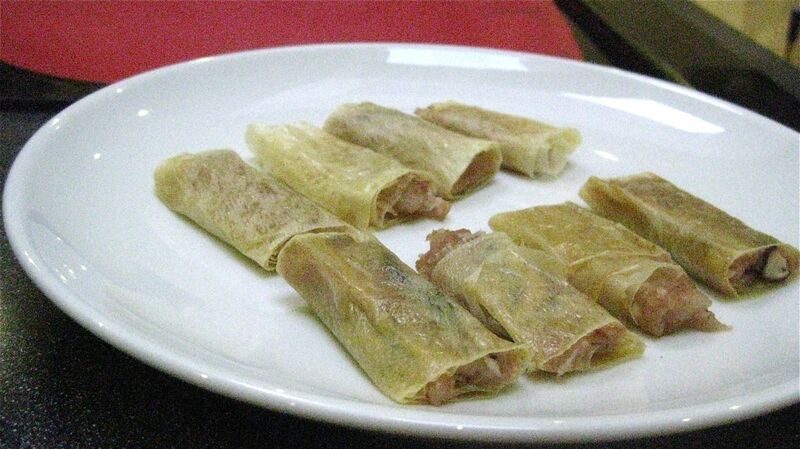 We also added beancurd rolls to our list of accomplishments that evening – these are filled with mashed prawn and bamboo shoots before being deep fried. Delicious! When finally we got to sit, we’d been cooking for a full-on three and a half hours. While the class is only meant to last for three hours, it was clear Jeremy cared more about getting us to learn the full extent of cooking than to rush us out the door. Over more glasses of wine, the group sat down to a very big, and very well deserved, meal. I’ll never look at dim sum quite the same but I will look forward to trying all of these at home again. I can’t recommend Jeremy’s classes enough – it was a great way to pass an evening. And if you’re on the hunt for a birthday present to please, this is definitely one to consider. ← Blessed Beer in B.C.